Any financially sound individual knows that the key to keeping oneself financially on track is always being aware of where you stand. In the midst of the chaotic, everyday life the chances of you taking the time to evaluate your finances is likely slim to none. You no doubt spend, sign up for services, and even contribute to savings often times on auto-pilot. The problem is, if you never take the time to review all your money-related habits, you’ll never know where you could have issues or be overpaying. Money issues could be keeping you that much farther from financial freedom and goals. While your monthly or weekly budget should help keep you on track for the most part, to truly evaluate your financial situation and make adjustments completing a thorough audit is the surefire way to success. There’s often scary associations with the word audit, however, not all audits have to be negative. In fact, simply put, an audit is really just an in-depth investigation. You’ll look at all your expenses, one-time and ongoing, purchases, financial records, and any other money-related activity. It’s a process that’ll illuminate any financial missteps or issues to help set your finances in the right direction. To begin the process of auditing your own finances, follow these five steps. A financial audit is no easy or necessarily fun task. That being said, the key to completing a successful one is staying focused. Stay on track, and push through to the end. Don’t decide to do your financial audit on a whim, at the end of the day, or even when there’s an array of people around to distract you. Find a solid chunk of time in the coming weeks where you have no other obligations. This when you can truly sit down and dig in. The more focused you stay and the less distractions you have will not only help you complete your audit quicker, but will ensure a successful one as well. To reiterate, an audit is a full examination of every financial-related aspect of your life. Nothing is to be left out. Gather together every financial document, bill, receipt, statement, and any other random financial document you can find. These records serve to help you better understand where your income is going and what your spending habits are. Be sure to organize documents accordingly, maybe even create categories to separate out the non-discretionary with the discretionary to get a first impression view of how your money is spent. 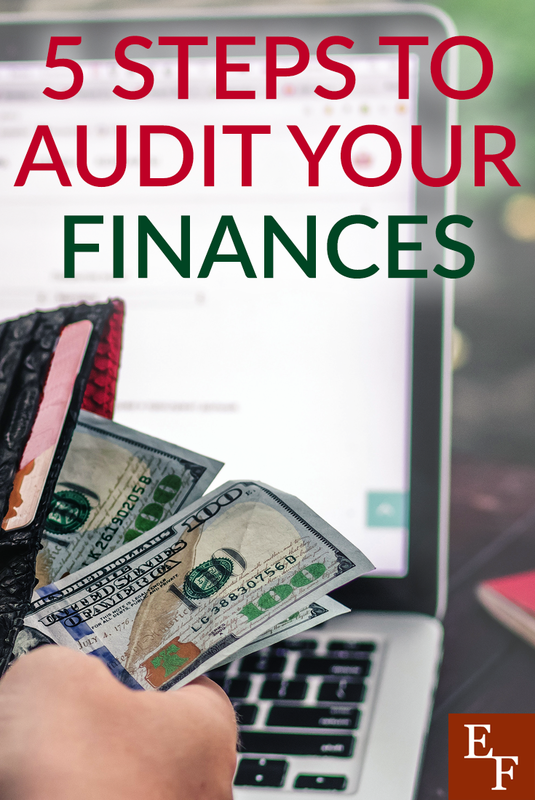 Your next step in your audit should be to identify any spending habits within your finances. View receipts, bills, and look for various splurges, unexpected, or extraneous expenses. See if you can illuminate ongoing patterns or habits in different areas of spending. You might discover that you spend too much money on takeout and food. Maybe you rack up too much debt, or spend more than you should on subscription services. Moreover, take time to review how and when you spend. Hint: Use Trim to help you automatically reduce your subscription expenses. Do you put too many charges on your credit card or have a tendency to splurge on payday? Whatever the pattern might be, by taking time to examine it yourself, you can decide if it’s one that’s detrimental to your finances. Inline with your spending habits is assessing all of your current expenses. Since your expenses are likely ongoing and possibly monthly, they’re one spending area that drastically affects your finances. $20 a month for one subscription service or $70 a week in groceries might not seem like a big deal. However, add multiple monthly subscriptions or calculate the monthly total of groceries, and those expenses begin to look a lot more expensive. List out all expenses and, like your documents, group them into categories and themes, i.e., transportation costs, food, entertainment, etc. Afterwards, review what areas are costing the most and see if you’re saving as much as you could be. You might find that you’re merely spending as much as you are because you didn’t think about it or haven’t reevaluated the cost in a while. Upon doing so, figure out where those funds could be better utilized. After all, putting extra money away into your savings or 401(k) will be more beneficial in the long run than paying too much for cable when you really just watch Netflix anyway. Identifying your spending habits and extra expenses is the first step, however, sometimes finding ways to save or cut back is easier said than done. That being said, once you identify areas that could be amended, come up with a strategy to refine your finances. Start meal planning to eliminate extra groceries, shop around and cutout unwanted or overly expensive services, make a plan to consolidate or reduce debt, and reallocate funds to contribute more to savings and goals. By strategizing ways to better your habits and reprioritize expenses, you’ll keep your finances on track and put yourself on the path to completing your goals and acquiring financial freedom. A financial audit is simply one of many strategies to benefit and stay on top of your financial situation. While it should in no way prevent or take the place of a monthly budget, an audit can give you a much more in-depth examination of your money patterns and priorities. It can help you gain better clarity of your current financial path. Plus it can provide direction for what you can do to put yourself on an even better financial foot. Your audit doesn’t have to be a long drawn out chore or something you even have to complete each month. Setting aside time to complete a full financial audit once or twice a year can illuminate financial missteps and issues. Plus it can guide you in the right direction towards a bright financial future. How often do you complete a financial audit? How do you go about organizing your financial documents for said purpose? Identifying those bad habits is really key. For my family, we found ourselves spending over a thousand a month, at $10 and $20 increments. It was crazy! Once we examined it we made some serious adjustments to the way we spend and we haven’t looked back since! I think you hit the nail on the head with the opening sentence – it’s about being aware of where you stand. It’s very difficult to navigate your way to a destination when you don’t know where you are currently, so know your present position, identify your goal and then plot your journey. The method or strategy you use to get there is almost secondary, but whatever you choose, you need to be recording income and expenses and reviewing and adjusting regularly. Thanks for the post! Phillipe Ballesio and his wife have a whole network of scams and thefts that they carry out through their multiple finance companies. They do not have any kind of permission to administer funds, but they ignore this and all they do is ribar. They are being sought by law and it would help a lot if they shared this info. Thank you.